The inspiration for a special celebration can come from any part of your life. Much of my inspiration for celebrations comes from things I have seen or experienced while traveling. Several years ago I traveled to Russia and fell in love with a set of Matryoshka (nesting) dolls. They are hand painted with a series of images from a Russian Fairytale. This bridal shower is inspired by the rich red, yellow and green colors of the dolls with and their beautiful winter fairy-tale images. 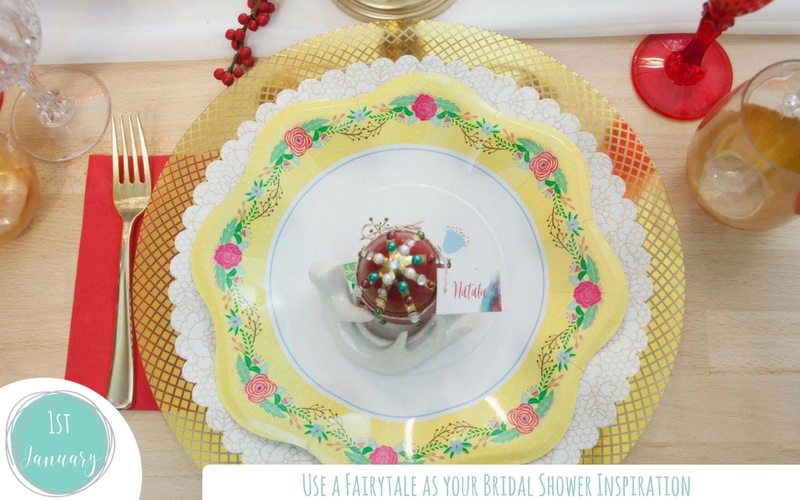 You’ll find all the details to create your own Fairytale Bridal Shower with a Russian heritage inspired table setting, bar, and backdrop over on Fun365. Marry Me by Oriental Trading has everything you need to See It, Shop It and Make. Fun details bring the colors of the nesting dolls to life, Ribbon chair backs, hanging florals and DIY Faberge Egg Place Cards all contribute to creating a bright, happy celebration of love. You’ll find all of these colors combined into a whimsical watercolor design by Jen T By Design. This design is part of our fabulous vodka and caviar tasting bar. Get the full DIY details here and create this unique and fun bar to entertain your guests. You’ll also find some easy to make Blini Hors-D’Oeuvres your guests are sure to love. One of my favorite details at this bridal shower is the trio of cakes. A delicious chocolate naked cake with frosted fruit is flanked by 2 cakes that have designs that match the watercolor design of the printables and the design on the plates used on the table. Get all the stunning details for this unique, ultra lush and ultra-affordable Fairytale Inspired Wedding. You can see it, shop it and make it with the click of a button!